Trapped is not an easy film to stomach, says Sukanya Verma. When the doorknob gets stuck, the key won’t fully turn in, the person on the other line can’t hear you or your screams fall on deaf ears, one’s first emotional response is to panic. Disconnect of any kind, if against one’s will, even momentarily, throws us into a mild tizzy. Director Vikramaditya Motwane not only dwells on this unpleasant and familiar sensation, but also prolongs it ruthlessly to create a stinging metaphor on survival in Mumbai’s aloof, apathetic, social environment. The Mumbai in his deeply claustrophobic and masterfully taut Trapped is as deceitful as the witch’s candy cottage in Hansel And Gretel. It seduces its starry-eyed inhabitants with lofty promises of happily-ever-afters in the form of high-rises, ones that go by the name of Swarg. And just like the kids of Brothers Grimm’s story, Shaurya (Rajkummar Rao), an ordinary office-goer on the threshold of realising his dream (a luminous Geetajali Thapar), discovers he’s walked right into a trap instead. Even in his previous films, Motwane’s characters are confined within an emotional predicament they wish to be released from. In Udaan, Rajat Barmecha is fighting paternal abuse. In Lootera, it’s a tie between Sonakshi Sinha’s irrational belief and Ranveer Singh’s nagging guilt. 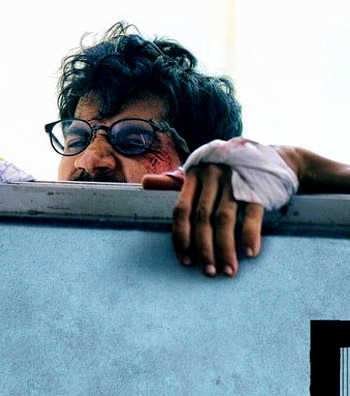 But in Trapped, it manifests into a tangible, rude reality where negligence and rotten luck contribute hugely to Shaurya’s harrowing experience of a worst-case scenario sparked by an ostensibly harmless situation -- getting locked inside one’s own apartment. In a lesser film, one would question the contrivances that lead to this crisis. He documents Shaurya’s metamorphosis in a manner that’s almost Kafkaesque in its contemplations but aspiring for a King Bruce and the Spider like allegory in its perseverance, while reminiscent of Castaway in its depiction of despair. Under just 103 minutes, Trapped treads more complexities than a straightforward survival story can possibly offer. A bulk of the credit goes to Amit Joshi and Hardik Mehta’s deft writing. Their leading protagonist is no Sunny Deol. He cannot break doors. He cannot scream his lungs out beyond a point. Armed with a pan and pakkad, Shaurya finds tools of hope in fire, blood and rain. Desperation drives him into making an irresponsible choice. Desperation inspires him to the path of self-rescue. Somewhere, indirectly, Trapped mocks the invincibility we assume to have acquired as residents of this magical city by painting Mumbai as a distant, dark and depressing land taken over by concrete zombies. Where everything that one craves in Mumbai -- space, privacy, view, trees or people minding their own business -- seem like a curse. Trapped is not an easy film to stomach. And not just when blades and pigeons show up in unison. Gloomy as things get, Trapped isn’t doused in cynicism. Rajkummar Rao, as the man at the receiving end of this unending ordeal, has everything to do with it. Quite early in the story, he establishes Shaurya as plain but resourceful. Though he has only a few lines to utter and props (broken bits of a fast wrecking flat) to wield, in addition to a believable musophobia, I was alternately moved and mortified by the depth of Rao’s agony. He internalises the frustration and willpower to craft someone heroic yet practical, shattered by the prevailing insanity yet simple enough to not hold grudge. Every man is a master of his destiny. It may not always bring him love but a new lease of life? One can always try. Trapped says it’s a good thing. Even in big, bad Mumbai.